Second time this has happened in the bath room. 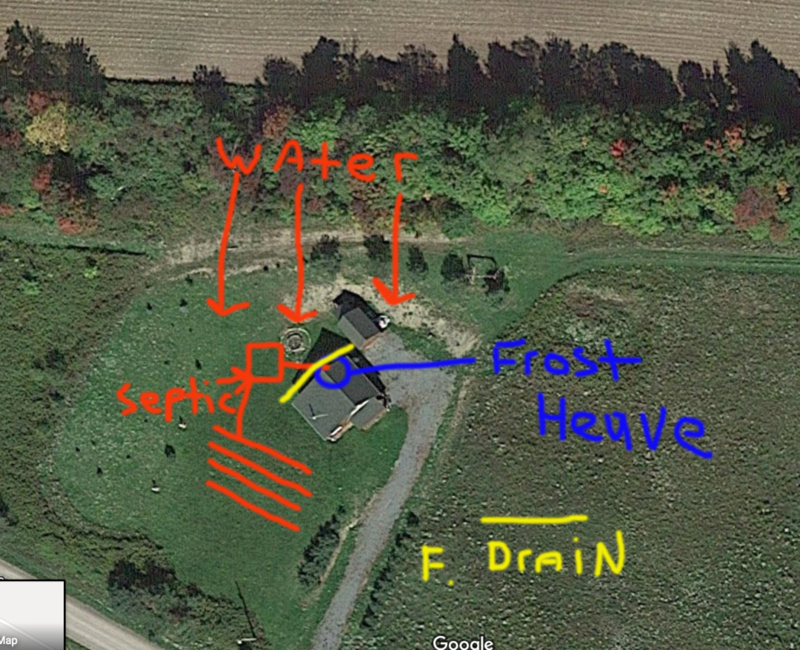 Seems that the main drain to septic system is subject to frost heave. Do I have to drain water away from this area? It is wet back of the cabin. Be nice if there was an expandable boot I could install on the line. Pushed the toilet over, bolts were not on the screws to hold it in place. Any thoughts would be appreciated. Seems very unlikely to me that your septic line being pushed up would lift your toilet. Does the main line exit the house very close to that toilet? I would think the main line would flex enough to not move your toilet,even if it does heave up a tad. Also,there is a rubber sleeve you can install on the line,two hoseclamps on either end. Recently we had a problem with a large (very expensive) casement window that wouldn't latch. Today we went to check it out and after about 30 minutes of monkeying with it the homeowner states that they've had all kinds of trouble with a yard gate and back door that is right next to the window in question. Seems as though a major frost upheaval has upset the apple cart. Major foundation cracks around the room are seen to by investigative peons (me and my boss) confirming the fact that the homeowners is f*c%ed. What if the back side of the cabin was sinking? Jump ship? lol Half the cabin is on piers the other foundation. I don't know just throwing it out there. That's exactly how I found my toilet once when my 280 lbs sister-in-law spent a weekend at our place. LOL I kid you not. Glad she didn't fall thru the floor below. Anyway, just trying to cheer you up, Burt. Hope you find out what the problem is and get it resolved. Maybe someone busted in and stepped on the can, then dumped it...........?? OK I'll check but in the corner is the hot water heater and pressure tank for well. That would of moved also. I'll check those things out. 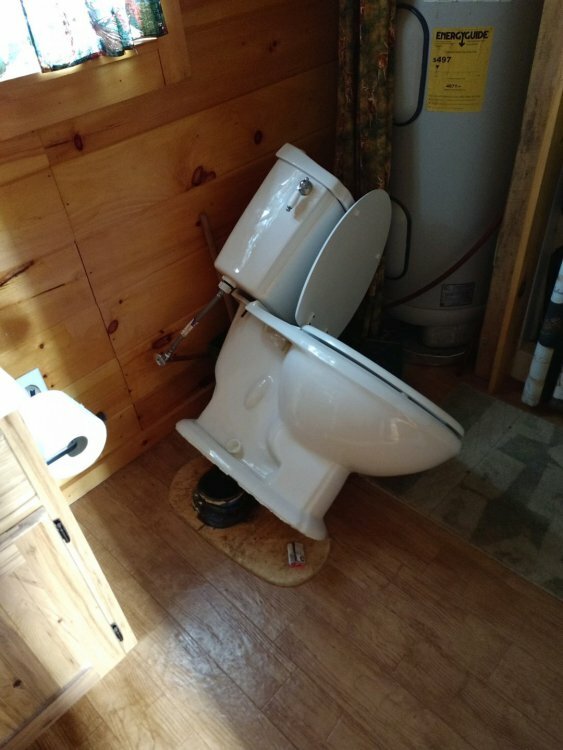 i think you just need to eat less venison chili if you wake up to find your toilet on its side. It absolutely could be frost heave on the line. if that goes through the floor and underground, but no below frost line and then a horizontal run. Is it dirt below that floor? Ours did the same thing at camp and it may not be a standing water issue. some soils are very susceptible to frost heavy. Have you ever walked around your camp are and seem tall frost and soil formations grow from the surface of the ground just over night on a very very cold night? Ours was bolted down and the T bolts were pulled right through the PVC flange. wouldn't that have lifted the camp up and pull the pipe apart rather than pushing the toilet up? Need to institute a no smoking rule in the bathroom... let us know what you find.. Discharge line should be surrounded in crushed stone, if it isn't I would do that. Which side is of the cabin is this on? the foundation side or the pier side ? If it's on the pier side, are they sunken piers or sitting on grade ? If they are on grade, I'd also look into having them dug below frost line and putting Crete down there. Another possibility is that septic holding tank has shifted ( also should be in stone ). The "wet" you see could be overflow from tank. If something's moving enough to knock over you crapper there could be other issues as well. As it sits, beware of the methane gas !!! Thank you all for your input. What I saw today was two lines that connect to the main drain, toilet. They are pitched now the wrong way. Thus believing the cabin did not sink but the main drain line heaved. There is a lot of water behind cabin and also where the main line goes into the ground. I believe I have to put in some drainage to alleviate the problem. Please keep suggestions coming. Thank you all. Dig the lines up and put gravel around them? How much deeper than the line should I go? I have similar problems at my camp, which is up on posts. I had to redo all the posts properly which put an end to the camp moving, but still have problems with the plumbing. My toilet drain exits the floor, then I have a gas trap before it goes to the ground unfortunately it enters the ground at a long shallow angle, which lifts the line up and down. It only goes to a 55 gallon drum, which needs to be improved. If you can take the horizontal septic line below frost line from directly below the toilet, then surround the vertical pipe with gravel as mentioned, it largely eliminates any heave on the pipe. 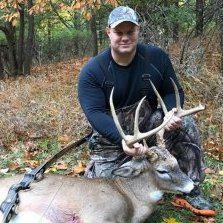 use a couple pieces of the flexible rubber elbows at the trap, and that will also minimize the heave.